Pete’s main job is as Centre Manager and coordinator of counselling and complementary therapies at Terrence Higgins Trust West in Bristol. He has worked in the HIV and voluntary sectors for over 25 years, and also taught at Bristol University for 18 years on the MSc in Counselling. 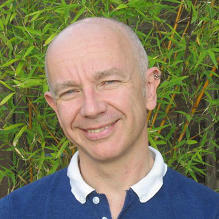 He brings significant experience as a trainer, group facilitator, supervisor, tutor and marker, as well as therapist. He also works with counsellors and psychotherapists in the voluntary, statutory and independent fields as an individual and group supervisor. Pete says: “Trained initially in humanistic and integrative counselling, I increasingly felt that something was missing and retrained as a psychosynthesis psychotherapist in order to try to explore and meet that need. I wanted a “psychology with a soul”, as Jean Hardy aptly describes psychosynthesis, an approach to understanding the human condition that very much resonates with my own personal experience. Psychosynthesis provides me with a map or framework for understanding my life, encouraging me to be both an active participant and compassionate observer of my experience over time. This alone is an amazing gift but one of many that the practice of psychosynthesis, including meditation, has given to me.